Old Aztecs Warm up Shirts. These are custom printed shirts so we will place order every 1st and 15th so plan your purchase accordingly. For those that prefer a looser, more traditional fit we have our Playing Weight jerseys. This jersey features the same brillant color fast designs as our tight fit jerseys but made in 5.5 oz. Aero mesh.. It is reinforced at all the stress points for durability. 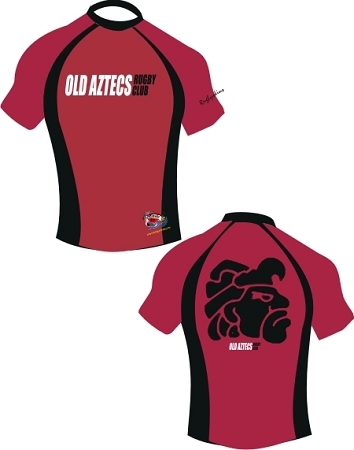 And fully sublimated which means you can print any design you want on it including individual players names and numbers. This jersey is available in a round neck and will not shrink or fade. It is tagless and has no shoulder seams. That means it's comfortable. It features a longer tail so your jersey will stay tucked in your shorts.